Topps announces that it has teamed with PSA to offer the first ever graded collector chips to be sold exclusively on eBay, The World's Online Marketplace�. Ten complete collector chip sets featuring the World Champion Boston Red Sox have been graded with several up for bid this evening on eBay via TheToppsVault.com. All 260 graded chips will be listed on eBay over the course of the next month. Each of the individually graded collector chips are featured in an exclusive slab created specifically for this first-time program. This exclusive program comes on the heels of Topps, offering the first-ever collectors chips depicting Major League Baseball players during the 2004 MLB postseason. 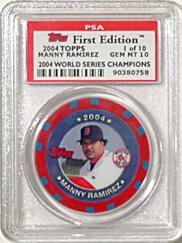 Un-graded Topps Collector Chips are currently on hobby store shelves and carry a $49.99 SRP. Available teams include the Boston Red Sox, St. Louis Cardinals, New York Yankees and Houston Astros.